It's show time for those competing in the 2017 Dakar Rally. 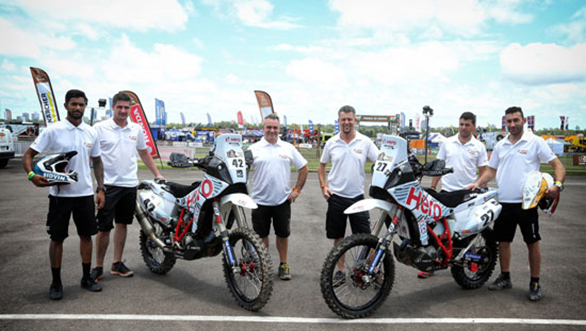 Of the 318 vehicles that will take the start today at Asuncion, Paraguay, will be two motorcycles from Indian team Hero MotoSports Team Rally. Piloting these motorcycles will be CS Santosh and Joaquim Rodrigues from Portugal. This will be Santosh's third time at the Dakar, while it will be a first for Rodrigues. However, Rodrigues showed impressive results at 2016 Merzouga Rally and Oilibya Rally of Morocco, finishing 9th and 15th, respectively. Santosh says he is feeling very optimistic about the team's performance this year at the Dakar. He also says that the preparation has been good, and that motivational levels are high. However, he thinks the biggest challenge would be dealing with the high altitudes and the constantly changing conditions. His team-mate, Rodrigues, feels the same way about how well the preparations have gone, and hopes to put on a good show in his first outing at the Dakar. This is the 39th edition of the Dakar, and the first stage will take competitors a total of 454km from Asuncion to Resistencia, Argentina. The 39km competitive section will comprise of technical tracks and trial-style sections. Although this is a short sprint, it's very important as it will decide the starting order for the second day. The participants at the front of the pack on Day 2 will avoid the fine chalk-like dust on the stage, which gives the region its nickname - Chaco. But it's only going to get tougher as the days progress. Competitors and their crew will spend six out of the 13 days at altitudes above 3,000m. However, the highest altitude that they will reach during the course of the Dakar will be 5,000m when they cross the Andes. To further complicate things, the weather forecast predicts rain for the next 10 days in Bolivia. Three stages, including the one with the longest competitive stage measuring 527km, will be held in Bolivia. Santosh says that if this forecast holds up, the rain, along with the low temperature and constantly varying altitude could "wreak havoc with our mind and our bodies."